If you think of electrons as the currency of chemistry, reactions are transactions of electrons between atoms. Just like double entry book keeping was developed to formalize how financial transactions are recorded, chemists have developed their own convention for showing transactions of electrons between atoms. It’s called the curved arrow formalism. Previously I covered how we apply the curved arrow formalism to drawing resonance forms. Here, I’m going to show how we can extend it to show reactions. The same principles that applied to resonance forms apply here to reactions, except that unlike resonance forms we’re dealing with actual reactions, not components of a resonance hybrid. The purpose of the curved arrow is to show movement of electrons from one site to another. Electrons move from the tail to the head. Most of the arrows you’ll see have a double-barb at the head, representing the movement of a pair of electrons. (note: there are also single-barbed arrows depicting the motion of a single electron; those are covered in detail here [see In Summary: Free Radicals). Other than a few problematic examples, every reaction you will encounter in Org 1/ Org 2 can be described using a combination of these three “moves”! However, unlike drawing resonance forms – which only involve changes in π bonds – the bond here in question can be either a single (sigma) bond or a π bond. 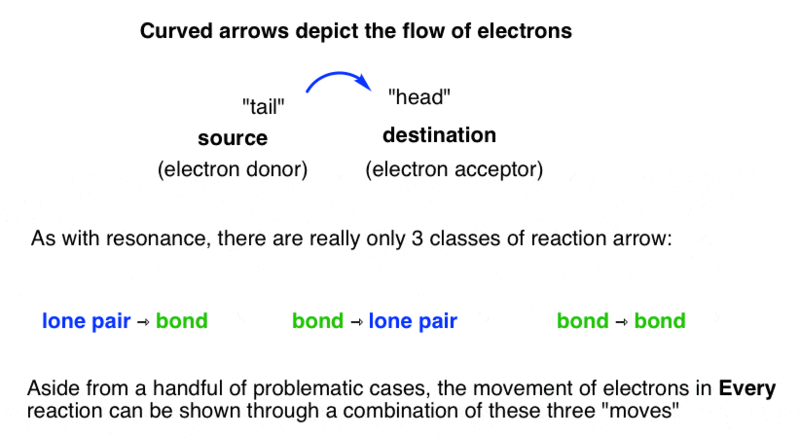 Since a pair of electrons are being donated from the “tail”, the atom at the tail will have a formal “loss” of one electron, making its charge more positive by 1. Also, since a pair of electrons are being accepted at the “head”, the atom at the had will have a formal “gain” of one electron, making its charge more negative by 1. Here are three general examples of each transaction. There’s a second layer of analysis that can be done here (sigma bond versus π bond) but that can be saved for later. 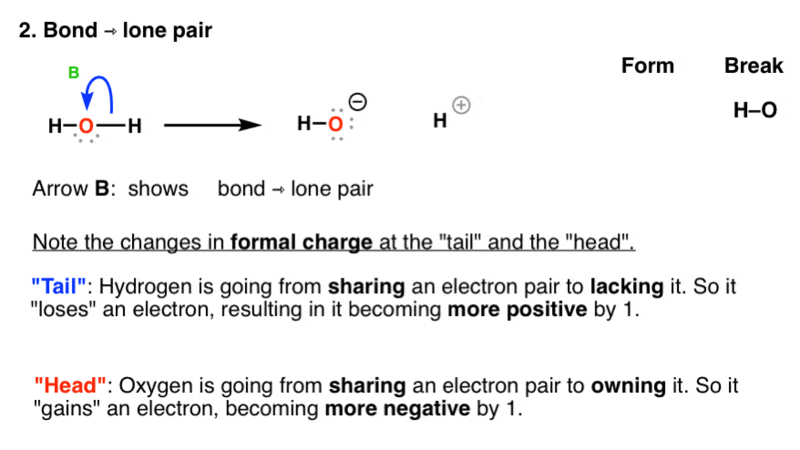 The first example shows the simplified example of a lone pair on a naked hydroxide ion going to hydronium ion (H+). (Note 1). The arrow shows the formation of a bond between O and H, with electrons from the lone pair on the oxygen. Note the changes in formal charge: the “tail” become more positive, and the “head” becomes more negative. The second example shows the reverse reaction: dissociation of water to give H+ and hydroxide ion. 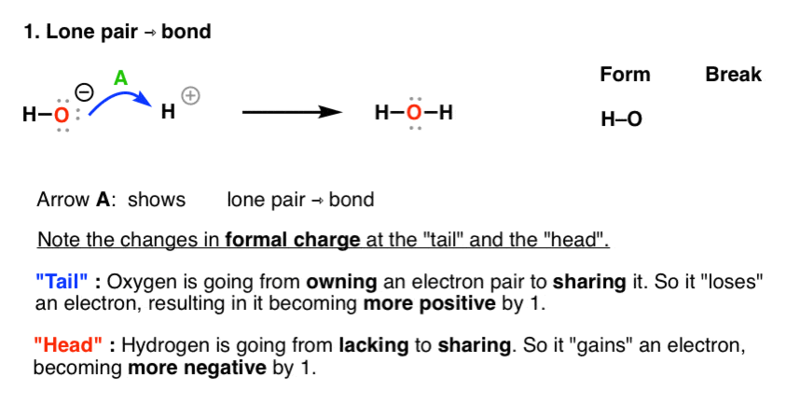 Here, the arrow shows the breaking of the O-H bond, to end up as a lone pair on oxygen. 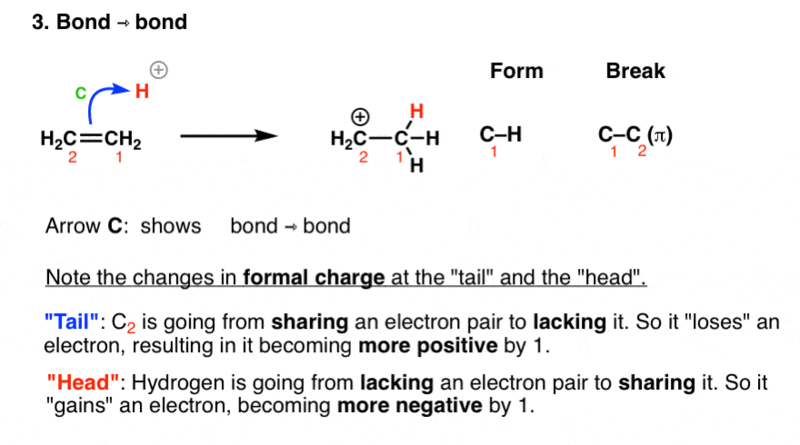 Note the changes in formal charge: at the “tail”, hydrogen goes from “sharing” to “lacking”, thus losing an electron. At the “head”, oxygen goes from “sharing” to “owning”, gaining an electron. We adjust the charges accordingly. (Why does it break this way? Rule of thumb: bonds generally break so as to put the electrons on the atom that will best stabilize them. Oxygen, being more electronegative than hydrogen (3.5 vs. 2.2) will better stabilize the additional electrons). Finally, an example of a bond breaking to form another bond. Here, the arrow shows the breaking of a π bond between C1 and C2, and the formation of a new C–H bond between C1 and H.
Again, the atom at the “tail” (C-1) becomes more positive by 1, and the atom at the head (H+) becomes more negative by 1. There’s a little problem with this type of curved arrow: the identity of the atom that is forming the new bond (C1 in this case) is somewhat ambiguous. For this reason, some instructors (myself included) occasionally draw an additional “dotted line” to remove the ambiguity. Others have developed a “bouncy arrow” technique. So to summarize, this “accounting system” lets us not only account for the bonds that are formed and broken during a reaction, it also lets us keep track of the charges. This is really useful! If you’re given a molecule with these “curved arrows” drawn on it, it’s a lot like a computer program. The arrows give you precise directions on what to do in order to obtain the product. Note 1: . I say it’s somewhat artificial because in reality, each of these will be accompanied by a “counter ion” of opposite charge). You are correct, sir. Thanks for the spot! thank you so much for this article.It really helped me.But I didn’t understand this “Again, the atom at the “tail” (C-1) becomes more positive by 1, and the atom at the head (H+) becomes more negative by 1.” does this mean the new product formed, H should have -1 charge and C1 +1 charge?I ‘m not getting it pls help. When H+ becomes “more negative” by 1, it goes from a charge of +1 to a charge of zero. Likewise when a neutral carbon (charge: 0) becomes more positive by 1, it goes from a charge of 0 to a charge of +1. Does that make sense? When lone pair to bond formation is drawn, is it ok if someone draw the arrow head in the middle of the atoms where the bond is formed? Yes, this is allowed. In fact it is probably better! For the last example, it is correct that had you not described that C1 is making the bond, that drawing a bond from either C1 or C2 to the hydrogen are both acceptable answers? There is some ambiguity with pi bonds, but C1 is the best answer, since the curved arrow “head” is closer to C1 than it is to C2 and also points away from C2. If one wanted to draw the arrow connecting to C2, the way to do it would be to draw the H+ closer to H2 and have the arrow point away from C1.